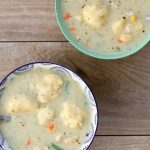 Instant Pot Ranch Potatoes–the easiest and fastest potatoes ever! This side dish of cubed yellow potatoes with ranch dressing seasoning and a little bit of butter couldn’t be easier to make but these potatoes will be eaten in no time. The perfect side dish to any meal. Today’s recipe is a very simple one. 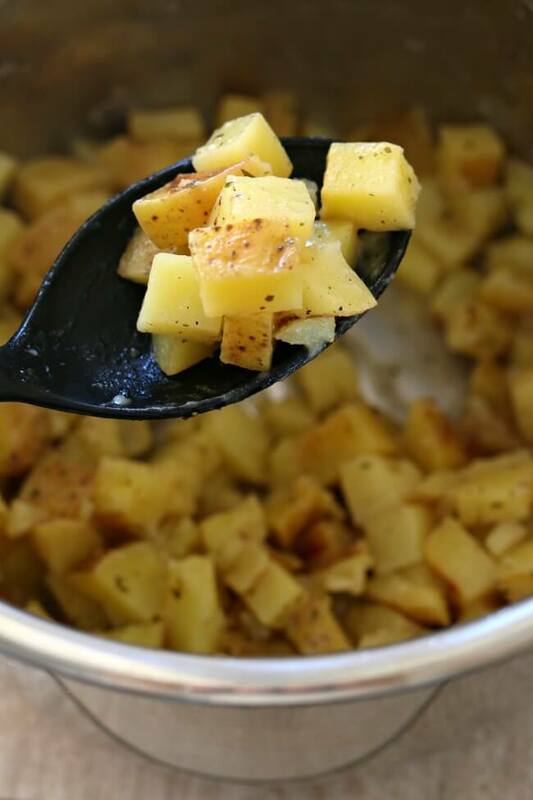 Cubed yellow potatoes with a little ranch dressing mix and butter. But sometimes the simplest recipes are the best. I have a feeling this side dish of potatoes is going to be making an appearance at many of my dinners when I’m in a rush. These potatoes only need 6 minutes to cook in your electric pressure cooker and then you can do a quick release of the pressure. They turn out buttery and well flavored thanks to the ranch dressing mix. I just buy the big container of Hidden Valley at my Costco. It comes in handy for lots of recipes. 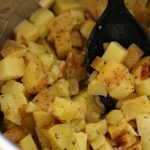 I used yellow potatoes for this recipe but you could also use red potatoes and get the same results. I would be wary of using Russets though. I’m not sure the texture would be the same. However if you do use Russets I would increase the cooking time by a couple minutes. For this Instant Pot Mashed Potatoes recipe I used this Instant Pot IP-LUX60 V3 Programmable Electric Pressure Cooker. It’s 6 quarts, so the same size as most slow cookers. It cost me around $80 on Amazon. When I made a similar recipe in the slow cooker I used this 6 quart KitchenAid Slow Cooker. 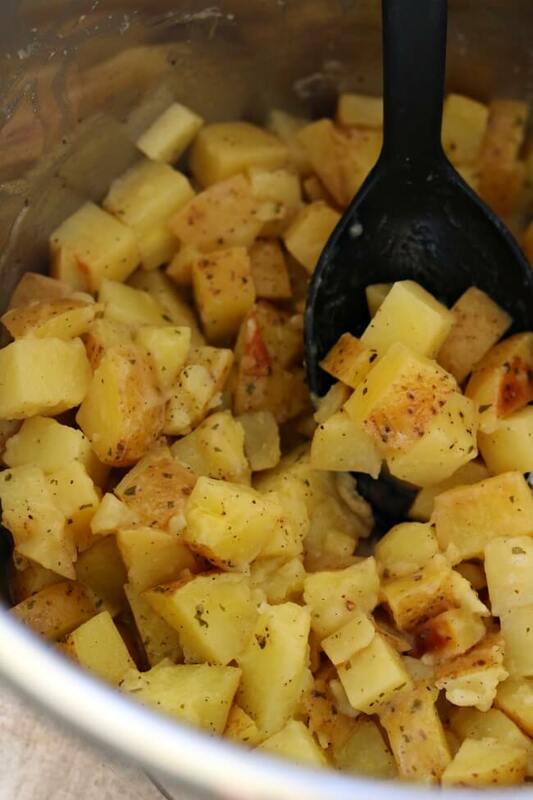 Place cubed potatoes in the Instant Pot. Sprinkle the potatoes with the ranch dressing mix. Cut the butter into 8 pieces and distribute evenly into the pot. Pour in the water. Cover the Instant Pot and turn the valve to “sealing.” Press manual and turn the timer to 6 minutes. When the timer goes off press the valve to “venting.” Once pressure is released open the pot and stir. Salt and pepper to taste and serve. Tried this with red potatoes and it turned out great. 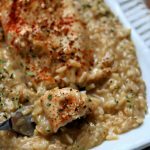 This was our very first recipe in our pressure cooker. We will definitely make this again. I love red potatoes. I need to try that. This was delicious! I put in 1 cup of homemade chicken broth because IP says at least 1 cup liquid and I’m terrified of BURN notice. Turned out out a little wet so I just sautéed high for a bit to reduce. Fabulous flavor! Thank you! Glad it worked well for you Risa! Just made these to go with pork loin. We added cheese, just because, and they were delicious! Will definitely be making these again soon. Thank you for sharing. I had some small russet potatoes left in the bottom of the bag and needed a quick side dish – so I gave this a try. I pealed them and cubed them up and made them according to your directions. They were so tasty!! This will be a go to from now on! 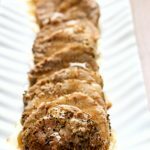 Thanks for a quick, easy, and delicious recipe! 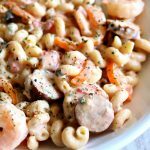 I am trying this recipe camping, but cooking for 5 adults and 3 kids as a side dish.How much did this recipe make, as far as servings go? I’d say 4 people. I would double it if I were you. Thanks for this recipe. I used the mini potatos in the variety of colors and cut them in half. They turned out so great that I am making them today for the 4th. Oh I love that type of potatoes! I’m glad you liked them. Hi Judy, I’m sorry yes I meant the kind from the bag. And with the 8 quart instant pot I believe you need more liquid. Does it say in your instruction manual? 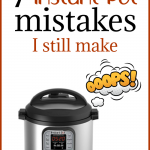 I believe you need at least 1 1/2 cups of liquid in your instant pot for the pot to come to pressure. Just increase liquid next time. I’m glad they sort of turned out anyway!! Would a 32 oz. bag of frozen hash browns work? I’m guessing I’d need to extend cooking time or thaw them first? I am not sure how it would work. But I wouldn’t thaw first if I were you. I would throw them in frozen and do a zero or 1 minute pressure cook time since they are parboiled they will cook very quickly. how many ups of potatoes would you say you used? Potatoes can be so different in size! Do you think broccoli could be added to this or would it be way too squishy? And does your end up with leftover water in the pot like mine did? Hi Tiffany, there was a little bit of water. But not much. I wouldn’t add broccoli in because when I cook broccoli I use a zero minute pressure cook time. So it would probably be disintegrated. I only had Fiesta ranch mix in hand so I used that. FABULOUS! Thanks for the recipe! 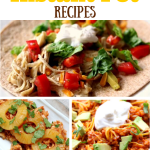 these are fabulous…i turned my instant pot to saute after they were done, added a little olive oil and sautéed them for a few minutes..they do stick to the bottom, though. Did you use the low or high pressure? Would red potatoes also work? If I double the amount of potatoes and seasonings, should I also double the amount of water? Do you put potatoes in a steamer basket or directly in the pot? I put them directly in the pot. My electric pressure cooker (8.5 qt not IP brand) calls for always having 1 1/2 cup water when cooking. Would that make these potatoes mushy? I bet it would be ok. You may need to drain some of the water. You could totally double the recipe. Don’t double the time. Keep the time the same. This sounds like something I have been watching for so I could use it in breakfast burritos. Hope you don’t mind that I want to drain them after they are cooked and brown them and a tablespoon or so of minced onion in some bacon or sausage grease (I know it’s not over healthy but, I love bacon grease to season) along with the bacon or sausage and add scrambled eggs to make breakfast burritos like a friend used to bring us at work. Thank you for the recipe.